Your crafty kids will love all of these homemade Valentines card ideas! Set up your craft supplies, and let kids show friends and family some love. Valentine’s Day is just around the corner. 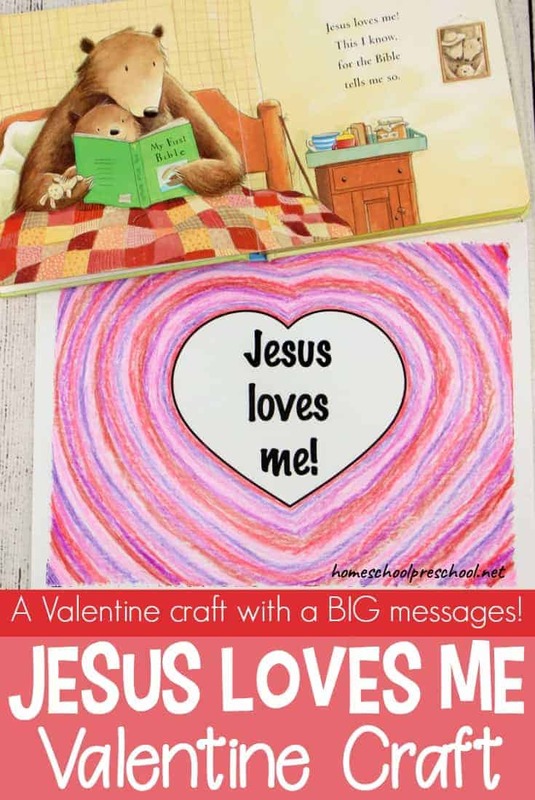 Your little ones are sure to have a blast creating unique, homemade Valentine cards for the people they love most. 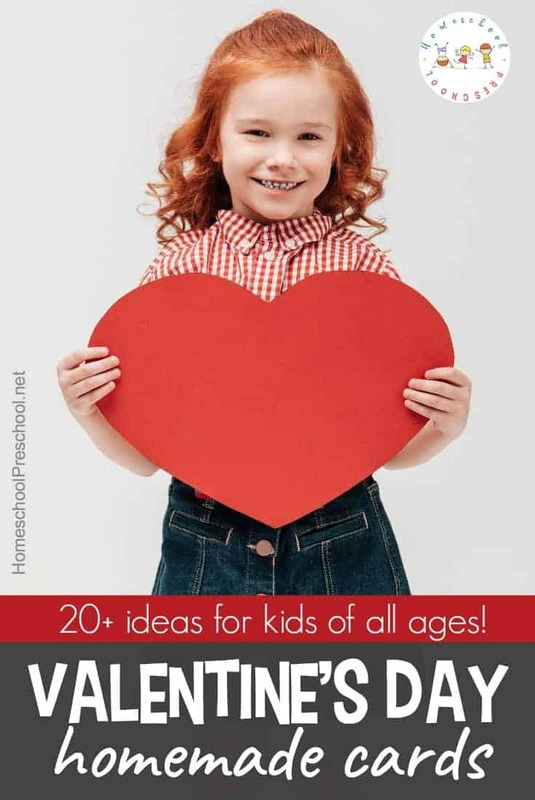 With more than twenty ideas featured below, your little ones can make a different Valentine for everyone on their list. These DIY Valentine’s Day Card Made with Paint Swatches will help your little ones build their hand muscles as they punch out each little heart. If your child is too young to use the punch, you can do that part and let them focus on decorating the card. Love Bug Valentine’s Day Cards are another great fine motor activity. Using small stamps like these to decorate the love bugs and sliding the lollipops through the slits are wonderful exercises for little hands. Your clever crafters will enjoy making Eye Heart You: Easy Homemade Valentine Cards. Googly eyes, construction paper, and glitter are all you need to get started! Spinning 3D Valentine’s Day Card will be a hit with older preschoolers. They’ll likely need some help from am older sibling or parent to complete it, though. Emojis are so popular right now, and this DIY Emoji Valentine Cards is so cute! Your kids will want to make more than one. Do not attempt to make these Heart Button Valentine Cards with kids who still put small items in their mouth. But, if you’re past that stage, this card is beautiful! Introduce your kids to paper quilling with this Valentine’s Cards: Paper Quilling for Kids activity. The results are so pretty. 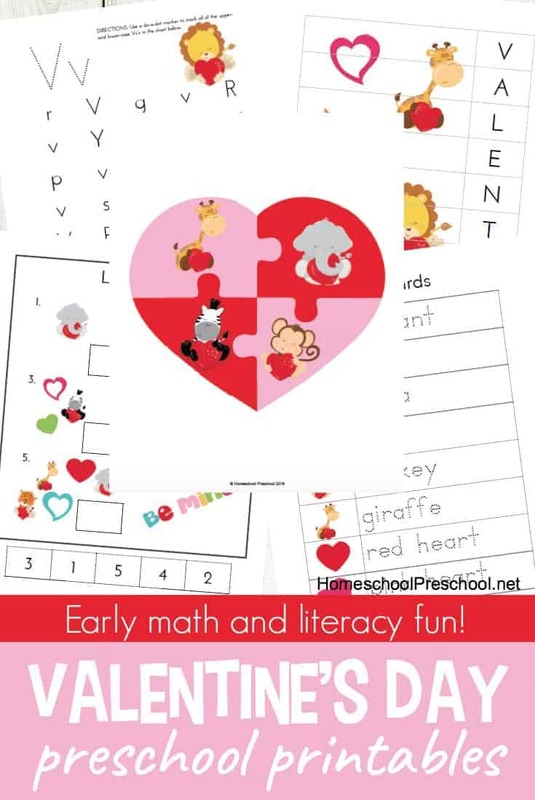 These Heart Collage Valentine’s Day Cards are perfect for toddlers and preschoolers with just a little bit of help from mom. Toddlers can make these Sticker Valentine’s Cards all by themselves. They’ll be so proud to share their creations with the ones they love. 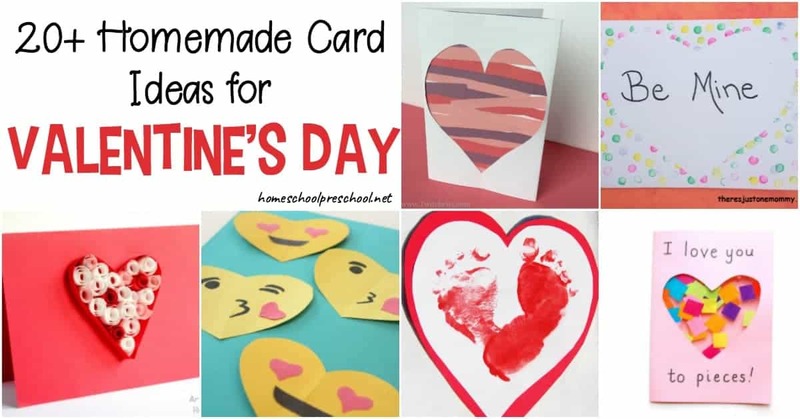 Toddler‐Made Valentine’s Day Cards allow even your youngest crafters to show their creativity! I don’t know a kid who doesn’t love playing with bubble wrap. They’ll love using it to make Bubbly Valentines Day Cards for Kids. This Love You to Pieces Suncatcher Card is a card and a craft all in one! The suncatcher makes a beautiful cover for this card, and it will look beautiful hanging in the window later. Have you got a little one who always wants to get in your makeup? If so, they are sure to get a huge kick out of making a Hugs and Kisses Card for someone they love! Scissor Practice Valentines are great for giving little hands some time to work with scissors. All you need is scissors, construction paper, and a glue stick to get started. I am a sucker for handprint and footprint crafts. I love looking at my now-grown kids’ preschool crafts. This Valentine Footprint Card is definitely a keeper! Spice-scented Cards are a wonderful sensory activity for both the giver and the receiver! If you are a planner girl like me, chances are you have an abundance of washi tape in your craft space. If so, check out this fun Washi Tape Valentines Day Craft. Your kids will love having the opportunity to dig in to your craft supplies. I love process art – art that has no right or wrong way to complete it. This Simple Heart Art for Toddlers fits that description. Here is another simple Valentine’s Day process art activity. Kids will make an Eraser-Stamped Valentine’s Day Card using a paper cutout, pencil, and paint. 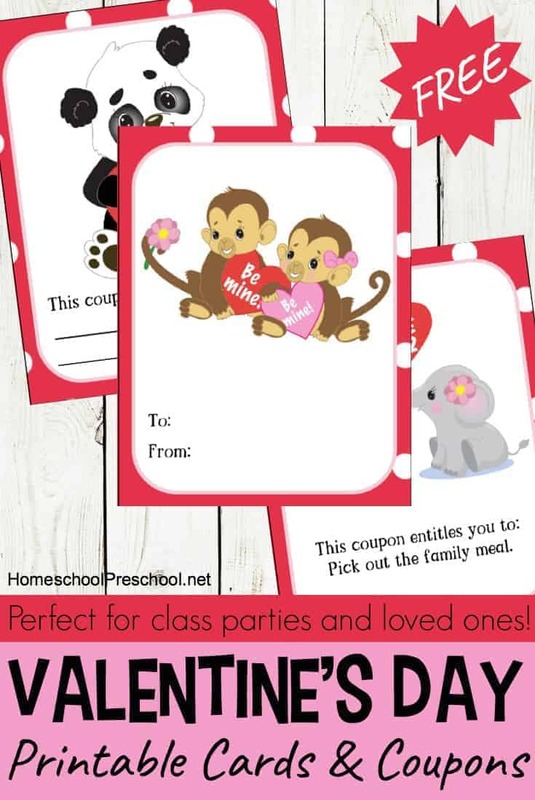 Scented Spice Painted Valentines Cards make wonderful pleasant-smelling Valentine’s Day cards kids will enjoy sharing with their loved ones. I’m saving this Truck Tracks Valentines Card idea to do with my grandson when he’s a little older. I’m sure, like his daddy, that he’ll love making crafts with his monster trucks. If your kids are old enough to blow bubbles with a straw, they’re old enough to make this Straw Blown Hearts Valentines Card. With all of these homemade Valentines Card ideas to choose from, which one will you choose first?